Ros and Seung Adventures: Whirlwind Weekend! How does it happen? 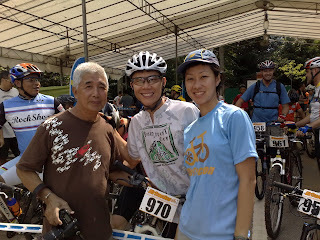 That Singaporeans could have 4 biking events over the same weekend??? Long time friend Kelly Ho invited us to join the SHEriders for the preview of the latest BMWF650GS. This bike is using the newest engine design from BMW, able to produce 71hp to 90hp, depending on the state of tune. It probably also sets the record for the best hp : fuel economy ratio, with an amazing 25 - 30km per litre economy! Rosalind helped out at this event, manning the event booth, while Seung spent the evening catching up with old friends like Kin, Ju Len & Rod over scrumptious burger & dogs supplied by the good folk of HD! Tourism Malaysia had put together a publicity event to bring motorbikers to Sepang for the coming GP. To achieve this, they paid for a barbecue dinner for local bikers and people we met (again) people from the previous evening, coming together for a good time. The good folk of Moto V were there, and so were the SHEriders and Team27. Rosalind scored a lucky draw prize : a free air ticket to KL, as part of the lucky draw prizes! Joining us for dinner were our friends Shannon & Jerry, together with Siew Yen & Maverick! Dainese - Riding Gear for Safety!